The intention of this blog post is to give you an overview of how to return products from projects to the warehouse or how to reverse their consumption. Since there are several approaches but not all are valid for all use cases, I will structure the blog post according to the use cases and explain the process in the SAP Business ByDesign system. Product allocation for a project for consumption at own site (Return Case C). In the left side you see the process steps. The straight forward process is displayed in yellow, the return or reverse in red. On the right side, the change in inventory is shown. When the project stock order is created it is related to on-hand-stock in the warehouse. After the pre-delivery outbound delivery is send to the recipient, the inventory holds the custodian and the project ID. In case, too many products were sent to the custodian, the unused products are sent back to the owner. If the products were reported as consumed, this must be cancelled first. Consumption reduces the inventory – independent if it is located to a custodian, moveable stock logistics area or a project stock logistics area. This will post the inventory back to the location where it was before. The consumption and the cancellation of the consumption to a project works in cases A-C the same way. 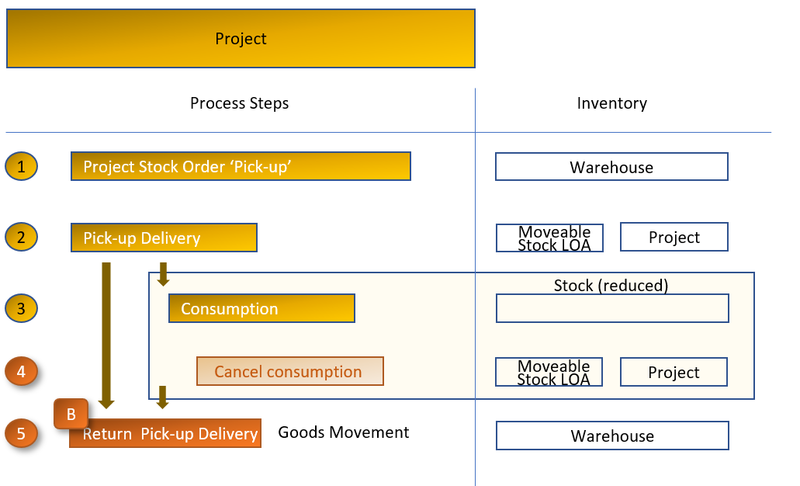 In order to return a pre-delivered product to the warehouse which is related to a project, you have to remove the link to the project in inventory first (Case A step a) in the figure). 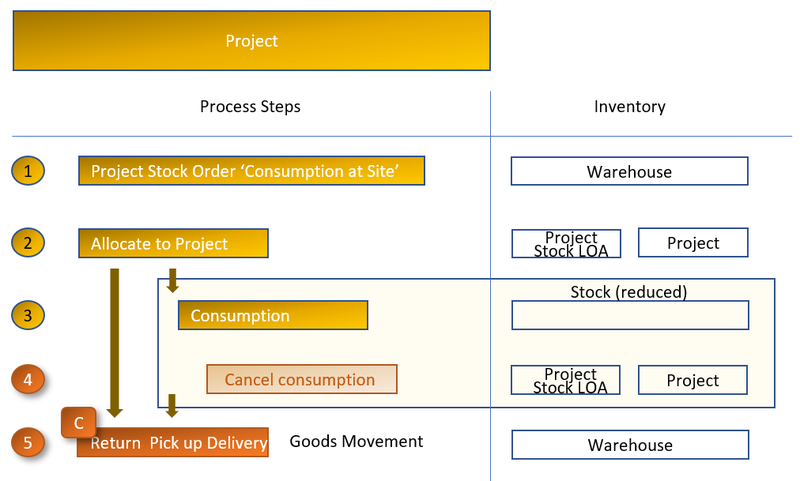 You can break the link to the project in inventory with the ‘Change of Pre-Delivered Stock’ Common Task in the Physical Inventory Work Center. Make sure to select the corresponding project ID. Then, as a second step (Case A step b) in the figure) you initiate a return of the products from the custodian to the warehouse with the ‘New Parts Return Notification’ Common Task in the Inbound Logistics Work Center. Please make sure you select the sender ID as the corresponding custodian related to the project. You continue with your usual inbound process either with creating warehouse requests or with the ‘Goods Receipt’ posting. 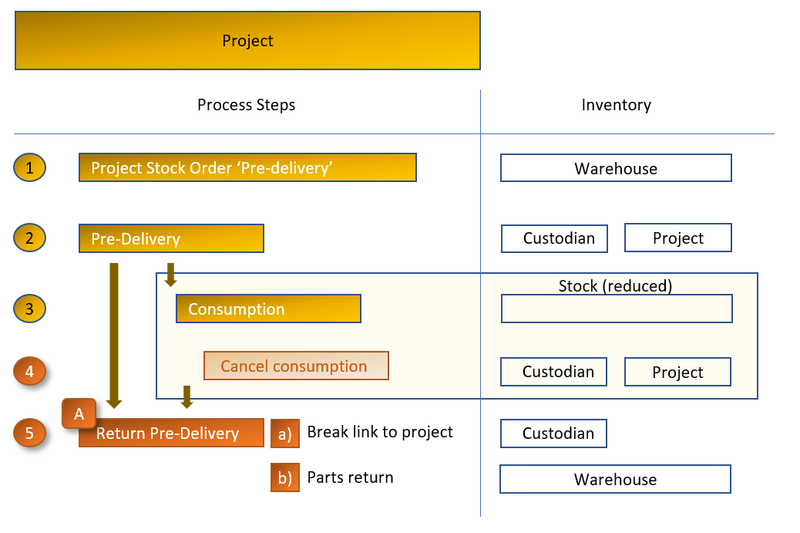 Since the parts return does not have any relation to the project or to project stock orders, the parts return quantity is not reflected in project management. After the outbound delivery is picked up by a person, e.g. a project member, here, the inventory is transferred to the moveable stock logistics area with the reference to the project ID. In case, too many products were picked up, the unused products are returned by the project member to the warehouse. If the products were reported as consumed, this has to be cancelled first as described above in the section ‘Cancel consumption to project’ (under Pre-Delivery). To return goods from the moveable stock logistics area you use the ‘Goods Movement’ Common Task in the Internal Logistics Work Center. Select the moveable stock logistics area as source and any warehouse logistics area as destination. For projects consider the corresponding project ID because the same moveable stock logistics area could be used also for service parts picked up by a service engineer. After the allocation of the stock to the project is completed, here, the inventory is transferred from the warehouse to the project stock logistics area with the reference to the projects ID. In case, too many products were allocated to the project, the unused products are given back to the warehouse. The return process is similar to the return case B except the source logistics area. To return goods from the project stock logistics area you also use the ‘Goods Movement’ Common Task in the Internal Logistics Work Center. Select the project stock logistics area as source considering the corresponding project ID and any warehouse logistics area as destination. With a consumption to a project the inventory in the warehouse is immediately reduced and the costs are assigned to the project. You can undo a consumption to a project that was initiated with ‘Consumption for Project’ Common Task in the Internal Logistics Work Center with the same transaction. Just make sure you select the Posting Type: Goods Return instead.